The emergence of cloud technology as the disrupter of the last decade continues as more enterprises embrace its benefits. 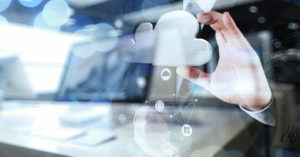 As the network became more complex in response to cloud migration, software-defined wide area networking’s (SD-WAN’s) trajectory also went from a niche market to widespread adoption as enterprises discovered the pairing of cloud and SD-WAN to be essential in their digital transformation plans. SD-WAN offers a number of answers to the challenges of networking with cloud applications. SD-WAN adds a virtual overlay to the physical network, so that network administrators can troubleshoot, maintain, and configure the network from a centralized location. They can also set business policies so that traffic is automatically routed based on how critical it is and whether it requires real-time connectivity. The cloud and SD-WAN also go well together because SD-WAN solves a host of other cloud challenges, including wasted bandwidth, dropped packets, increased latency, and the inefficiencies in the network that come with a traditional or hybrid WAN setting. SD-WAN is able to fully integrate the edge of the enterprise and offer connectivity to branch locations and mobile devices. The technology is a welcome addition to a cloud environment because it increases bandwidth options, provides centralized control, and offers real-time delivery to Internet of Things (IoT) devices. Partnering SD-WAN with a cloud environment will have additional benefits in the future because SD-WAN is adopting more application-based consumption models. This is a good fit because the enterprise is increasingly app-centered and defined. The number of available apps is at an all-time high, and companies recognize that there’s a lot of money to be made with in-app advertisements as well as in-app purchases. In order to support the kind of app activity and data volumes that the cloud environment and IoT introduce, SD-WAN will need to offer the capability of business policies based on intent and traffic will need to be directed to the platform on which the apps are deployed. It’s also important to consider what security features will be necessary to allow the perfect partnership between cloud and SD-WAN to continue. This will likely entail built-in firewall capabilities, as well as a cloud-based gateway for intelligent direction of traffic in certain situations, such as when an app has moved from one provider to another. In the future, SD-WAN should efficiently and effectively prioritize network traffic based on both application and enterprise requirements. To learn more about the advances of SD-WAN as it matures to support cloud migration, contact us at Wanify.